Forced checking account reformation yields inconsistent results for FIs. Boston, October 31, 2013 – Checking account and debit card market conditions in the United States have changed dramatically since the 2011 enactment of the Durbin amendment. 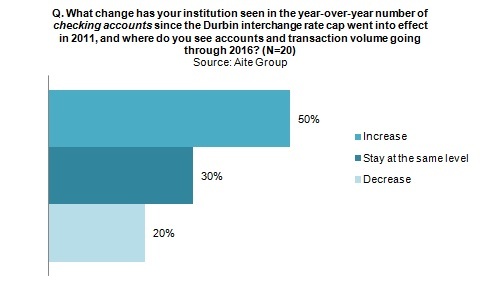 The regulation's interchange rate caps created a significant revenue shortfall for big banks, forcing them to lose revenue and rework checking account pricing strategies. FIs combating further revenue erosion by increasing checking account minimum-balance requirements, increasing fees, and limiting rewards programs have garnered mixed results. Now, banks make organic account growth a top priority while contemplating more pricing changes. How can your FI overcome hurdles to healthy growth? Based on a summer 2013 Aite Group survey of checking account and debit card executives at large FIs (assets of more than US$10 billion), this report by senior analyst Madeline Aufseeser identifies market trends and opportunities, discusses the value of loyalty programs, and divulges key areas of focus for core retail products, including checking and debit card accounts. It is the second in a series of two reports on the U.S. debit card market--find the first here. This 45-page Impact Report contains 44 figures. Clients of Aite Group's Retail Banking service can download the report.